Award Winning Indie Horror Film ‘Pieces of Talent’ Now Available on Home Video! We received word today on an award winning indie horror film entitled Pieces Of Talent from co-writer/director Joe Stauffer. The film is now available on limited edition DVD & VHS. Pieces Of Talent features special effects by Tony Rosen who created the Annabelle doll for The Conjuring. Read on for more details on the film. Pieces of Talent features special effects by Tony Rosen, who created the iconic Annabelle doll for The Conjuring and the upcoming Annabelle. Stauffer’s unrelenting vision brings to mind the visual finesse of David Fincher’s Se7en with the unflinching intensity of Tobe Hooper’s The Texas Chainsaw Massacre. In addition to the DVD, Pieces of Talent is also available for instant stream on your computer/mobile device and on limited edition, bloodied VHS tape. Collectors can also take home a unique “death scene” VHS and a hand-crafted bobble head. All of these items are available directly from the filmmakers via the Pieces of Talent webstore. 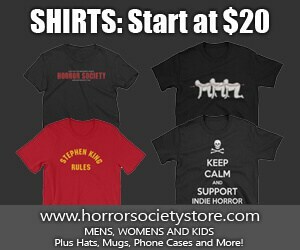 For a limited time, you can enter the coupon code “horror” at check out to save $2.00 on your order. David Long, who co-wrote the script with Stauffer, stars as a maniacal serial killer posing as a filmmaker, with Kristi Ray as his latest muse. They are joined by Jon Stafford (Full Metal Jacket), Barbara Weetman (Stuck in Love) and Taylor Kowalski (Cabin Fever 2: Spring Fever). For more information and to purchase Pieces of Talent, visit the film’s official website at PiecesOfTalent.com. Pieces of Talent can also be found on Facebook, Twitter and Instagram. Previous article ‘Pride and Prejudice and Zombies’ Film Adaptation Back On Track! Next article Watch The Gruesome Red Band Trailer For ‘Septic Man’!